Harvard President Drew Faust (from left) makes introductory remarks before moderator Hon. Alberto Mora leads a panel with military academy superintendents Vice Adm. Walter E. "Ted" Carter, Lt. Gen. Michelle D. Johnson, and Lt. Gen. Robert L. Caslen Jr. to discuss fundamental military values and the role of human rights in our national security strategy. Three-quarters of the way through a panel discussion of military values and ethics, hosted by the Harvard Kennedy School’s Carr Center for Human Rights Policy, moderator Alberto Mora, a senior fellow at the center, cut to the bone: If terrorists aren’t following the rules of warfare, why should we? 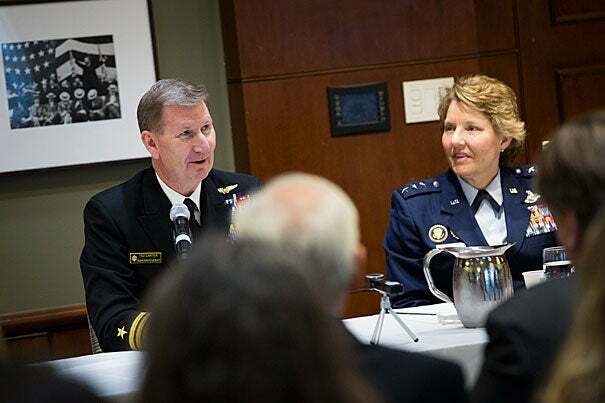 The response was unified and emphatic at Friday’s session from the panelists, three superintendents of U.S. military academies. The American military, they said, must uphold U.S. values, and this means adherence to the rules of engagement. Even today, when the U.S. military must engage in combat in “shadow zones” where fighters are not identified by uniforms and “it seems like we’re playing with one hand tied behind our back, against enemies that have an advantage,” the military must keep stressing ethics in its leadership programs, Carter said. That was also a point emphasized by Lt. Gen. Robert L. Caslen Jr., superintendent of the U.S. Military Academy at West Point and a former chief of the Office of Security Cooperation-Iraq. “The wars that we have been fighting are conflicts of wars of ideology,” Caslen said. “In this ideological struggle, the actions of the United States are particularly important.” Human rights violations at the Abu Ghraib prison in 2003 and detention of terrorism suspects at Guantanamo Bay helped create more terrorists not only by mobilizing extremists but by motivating moderates to be more extreme, Caslen said. “You can’t drain that swamp. You can’t kill your way out of it. It’s an ideological struggle. And that’s why rules of engagement are as they are,” he said. As Johnson said, “You can check the squares on the honor code, and this is not sufficient,” which is why, she said, the Naval Academy is a “champion” of education in liberal arts as well as science, technology, engineering, and math. In response to a question posed by Richard A. Cash, a senior lecturer at the Harvard T.H. Chan School of Public Health, about the effects of eliminating the military draft, Caslen acknowledged that 40 years of an all-volunteer military have widened a troubling gap between those who serve and those who don’t. “The best way to bridge that divide is to have ethical behavior in the military,” he said. Carter emphasized that, like doctors, lawyers, and clergy, the military should be seen as a professional organization bound by moral codes, concepts of freedom, and constitutional checks and balances. Leadership training helps military officers to understand what are legal, lawful orders, and to act accordingly. And for the U.S. military, the chiefs said, everyday American politics are an exterior factor that doesn’t challenge a deeper ethos. The John F. Kennedy Centennial Symposium, honoring the 100th anniversary of John F. Kennedy's birth remembered the president and his policies, and his understanding of global ties.